Jose and Hilary were once just lowly PY1 students going to school learning about patient care and how to manage athletes’ injures. Never in their wildest dreams would they have imagined that in their PY2 year they would be learning with the St. Louis Rams professional football team. So far this semester, we have witnessed a diverse array of injures from ACL tears to quadriceps strains, but the most unique aspect is that the players will and need to be healthy for their job. 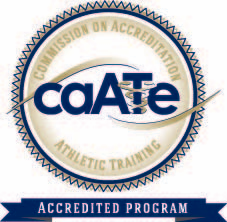 The role of the athletic trainer in professional sports is the same as any other level except that they are responsible for the athletes’ ability to do their work. Our responsibilities as athletic training may seem canned or trite, but the minuet tasks we accomplish daily allow the athletic training staff to perform their job. Self-titled hydration coordinators, we set up and break down the field for practice with water, Gatorade, and other supplies to help the players stay hydrated. 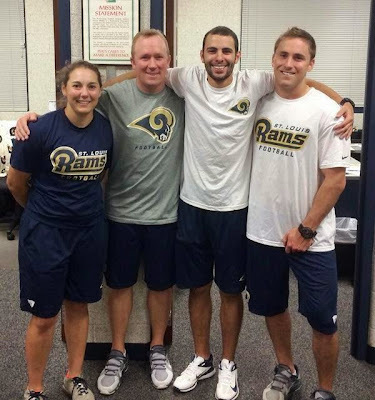 We could tell you the facts about the Rams organization such as the number of Super Bowls (3), the amount of time players spend in the athletic training room (a lot), or the number of ankles taped during an entire season (too many to count). What we cannot tell you is what this means. Being a part of the Rams organization has taught us that there is more to football than what you see on TV. The players and coaching staff are genuinely kind to us and appreciate all of our hard work. Although the players tackle hard on the field, they are athletes who grew up with a dream of making it to the big leagues. The facts are boring. What is exciting is seeing a player who could not sit up from a treatment table battle through his injury to make a tackle. Or seeing a rookie, unsure of his place on the team, craft himself into an integral part of the Rams community. Being given the opportunity to find our place in this community had taught us more than we could have ever imagined. More than just evaluation techniques, tape jobs or rehabilitation protocols. It has taught us how to be better athletic trainers and better people. We would like to thank Reggie, James, Bryon, Tyler, and Nick for coaching us in every aspect of the job. Also the entire coaching staff and front office staff for making us feel at home in Rams Park. And of course the players who tease us when our ice bags are not made to perfection or the HRV program does not work as quickly as we want it to. Thanks to all of you we grow everyday. We look forward to the rest of the season with the Rams and expect great things!